The Book of Mormon was first offered for sale to the public in Palmyra, New York on March 26, 1830. I am writing this on January 27, 2016. The Book of Mormon has been generally available now for 67,878 days or 185 years, 10 months, and 2 days. Why do we not yet have a generally accepted New World map? Does the Book of Mormon text contain hundreds of data points that could help establish a real world location? Yes. Have hundreds of intelligent people spent hundreds of thousands of hours working on the problem? Yes. Then, why has the puzzle not been solved? (Actually, I believe it has. See the article "Book of Mormon Lands Map January 2016.") It is highly likely one or more red herrings has kept most researchers barking up the wrong tree all these years. Red Herring. Noun. "A clue that is or is intended to be misleading or distracting." 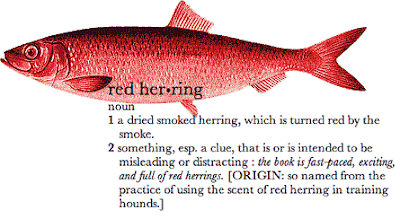 Origin of the Term "Red Herring"
Has there been a red herring in the Book of Mormon geography enterprise? Yes. In fact, I believe there have been two of them. A side note: One of the many reasons to visit Bergen, Norway is to see the quayside Bryggen, Hanseatic League offices and warehouses that were used to ship dried, smoked herring and cod all over northern Europe. Red Herring #1. The narrow neck of land is an isthmus. The narrow neck is referenced twice in the text. Alma 63:5 says the narrow neck was on the west sea by the Bountiful/Desolation border. Ether 10:20 says the narrow neck was by a single Jaredite city at a point where we will find a distinctive land/sea/land pattern in the coastline. Is there anything in these verses that suggests an isthmus between two oceans? No. These verses are describing a portion of the west seacoast. Some students believe the small neck referenced in Alma 22:32 is the same natural feature as the narrow neck. I share this view and typically call it the narrow (small) neck of land. Alma 22:32 describes the same Bountiful/Desolation border we saw in Alma 63:5, adding that the boundary line was a relatively short day and a half journey from a point in the east to the west sea. Alma 22:33 adds that the Bountiful/Desolation border was a defensive line manned by Nephite military personnel on the Bountiful side. The military mission was to keep the Lamanites hemmed in on the south. Mormon tells us again that the Bountiful/Desolation defensive line ran from an unspecified point in the east to the west sea. Is there anything in these verses that suggests an isthmus between two oceans? No. These verses are describing a portion of the west seacoast where the topography supported a relatively short defensible east/west line. Helaman 4:7 describes a similar shorter defensive line in the same general area that ran from an unspecified point in the east to the west sea. Alma 50:34 says that near the Bountiful/Desolation border a seaside narrow pass led from the land southward into the land northward. How many seas were there by the narrow pass? One, but it had both an easterly and a westerly component. This is likely a portion of the west seacoast where a sandbar separated the open ocean from a saltwater lagoon. All of these passages refer to one and only one ocean - the west sea. Gareth Lowe was the first to point out the non-isthmian nature of the narrow neck in his Book of Mormon maps elaborated in the 1960's and '70's. See the article "Gareth Lowe's Maps." Ric Hauck elaborated on the peninsular rather than isthmian narrow neck in his important 1988 Deciphering the Geography of the Book of Mormon. Red Herring #2. Ammonihah was west of Sidon because Melek was west of Sidon. Melek was west of Sidon Alma 8:3, but how far west? Could it have been 100 kilometers to the west as some theorists propose? No. Textual scholars, Royal Skousen chief among them, recognize that the Book of Mormon is highly consistent in its word usage patterns. Skousen calls this tendency "systematic phraseology." The phrases "east of Sidon" and "west of Sidon" can be shown in other contexts Alma 6:7, Alma 43:53 to mean riverside. Therefore, the fact that Melek was west of Sidon almost certainly means that it too adjoined the river. If Sidon flowed northwesterly past Melek, Ammonihah would be north of Melek Alma 8:6, but east of Sidon. 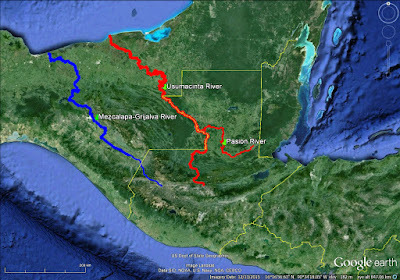 Mesoamerican rivers that have been seriously considered as Sidon - the Pasion, Usumacinta, and Mezcalapa - Grijalva, all flow northwesterly over much of their length. The Mezcalapa - Grijalva is shown on the map below as it flowed in Book of Mormon times. See the article "Wandering River." Ammonihah was the headquarters of the cult of Nehor Alma 15:15, Alma 16:11 and his successor, Amlici Alma 2:1. Gideon was a teacher in the Church Alma 1:7 in his namesake valley Alma 2:20. Gideon was explicitly east of Sidon Alma 6:7. Nehor was travelling through Gideon to reach Ammonihah Alma 1:5-7 when he contended with, then slew the aged Gideon Alma 1:9. Therefore, Ammonihah was east of Sidon. When Amlici invaded Zarahemla, he attacked from the east Alma 2:15. Therefore, Ammonihah was east of Sidon. Ammonihah was associated with Aaron Alma 8:13-16. Aaron was associated with Nephihah and Moroni Alma 50:14 in the SE quadrant Alma 50:13 of the greater land of Zarahemla. Therefore, Ammonihah was east of Sidon. These articles lay out the details of Ammonihah in context east of the central Sidon corridor. Garth Norman was the first to show Ammonihah east of Sidon in his seminal 2006 Book of Mormon - Mesoamerican Geography: History Study Map. Article updated January 16, 2018.